Purchase this CD for only 12.00 !! This wonderful CD that is the fundraiser for the National Youth Conference, includes songs written and sang by different artists, most of which were written for this project only!!! There are artists like HAROLD ROBINSON of Dallas, TX-TERRI MAYS of Chicashaw, OK-GERALD TURNER of Houston, TX-the J.H.B. CRUSADERS of Detroit, MI-TERRI JACKSON-MILLER of Memphis, TN and many more!!! NOW AVAILABLE-VOL. 2 faeturing CHORUSES and MALE ENSEMBLES like Tabernacle, The Gospel Hour Radio Chorus, The Soul Influence, The Oklahoma City Area Wide Chorus, The Soldiers of Power, and many more !!! Reg. Price only $13.50 !! ON SALE NOW FOR $12.00!! 1. FIRST TIME ATTENDING THE NATIONAL YOUTH CONFERENCE. 2. AGES 14-16 (Single parent~2 or more children, single parent~low income, 2 parents~3 or more children), 1 child per household may enter. 3. Essay must be 300 words in legible print (or typed) staying on the specified subject. WINNERS WILL RECIEVE FREE REGISTRATION AND A FREE CD !!! HOW WOULD GOING TO THE NATIONAL YOUTH CONFERENCE BENEFIT ME, AND EXPLAIN YOUR FINANCIAL HARDSHIP. A.R. RECORDS IS ABLE TO DO THIS THROUGH PEOPLE PURCHASING A YOUTH CONFERENCE LOVE CD THAT WAS MADE JUST FOR THIS PURPOSE. 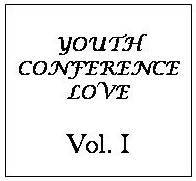 IF YOU NEED MORE INFOMATION OR IF YOU WOULD LIKE TO SUPPORT THIS GOOD CAUSE BY ORDERING A YOUTH CONFERENCE LOVE CD VOL.1 or VOL.2, they are available now. We also accept donations.